What Red Wine Pairs With Salmon? 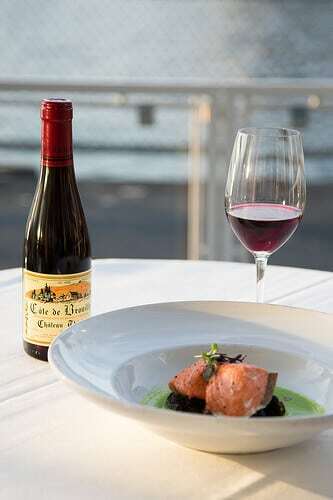 Living in the Pacific Northwest, pairing salmon with Oregon Pinot Noir is a big thing. And a good thing. (Hi, Martha.) But can you consider, for a moment, an alternative? Go Gamay, go! I love you so. The grape that makes the wonderful red wines of Beaujolais is so choice. And speaking of this grape and wine region, I was invited to attend a Beaujolais and salmon dinner for a group of Seattle-area media folks at AQUA by El Gaucho. Both fish and wine got me stoked…ON LIFE! 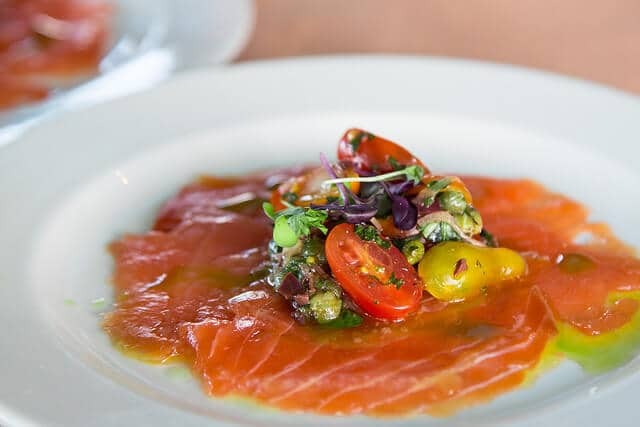 I figured the first course (pictured at the top: salmon carpaccio with cherry tomatoes, capers, nicoise olives, and a lemon vinaigrette) would be a best bet with the rosé that started this salmon show. (That would be the 2014 Laurent Gauthier Beaujolais Villages.) But the carpaccio was surprisingly good with the omnipresent (as in, you should have no trouble finding it), quite tasty 2013 Louise Jadot Beaujolais Village. The richness of the salmon and the tangy olives had something to do with it. The Jadot would have been an even better match if served slightly chilled; all the wines would have benefited from some fridge time. I just should have asked for an ice bucket. This is what happens when you bury your feelings. Lesson learned! The time I showed how serious I am about Beaujolais by emphasizing my point with a dramatic hand gesture. I also enjoyed the 2011 Jane-Claude Debeaune La Madone Fleurie. It’s a Georges Deboeuf wine, he of the ubiquitous Beaujolais Nouveau you see come November. Do not, however, confuse the two. Fleurie is one of the crus, or top sites, of Beaujolais. Ask your wine pals for Cru Beaujolais and enter a world of value, joy, and elegant refreshment. 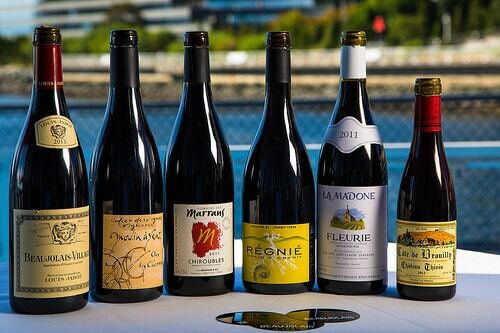 If you are dropping a lot of cash for serious Pinot Noir–or suffering trying to but it on the cheap–consider mixing up your red wine repertoire and start gulping Gamay, Cru Beaujolais-style. This is one funky, cloudy wine. 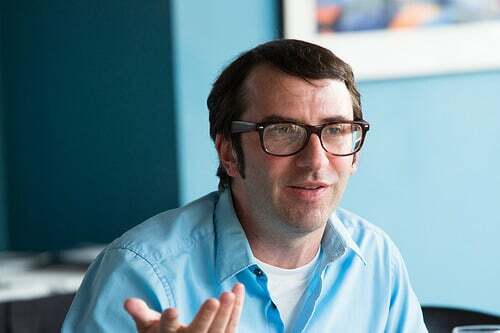 I was sitting next to a visiting sommelier, Joshua Orr, who said it was like a sour beer. Definitely for those seeking out something different. It was paired with a salmon dish with a fruit relish but this wine would shine brighter with loads of mushrooms or anything umami-ish. This is my everything. I need a moment. The wine of the night was an old friend. One of my favorite wines of all time. And it doesn’t cost a fortune! The SRP is $23. REJOICE! In a serendipitous moment, it was served with my favorite of the salmon dishes sampled: cedar smoked with roasted morels and a watercress puree. Jeez, look at that photo to the left. You’re water-side at AQUA in the Seattle (non-sweltering) summer. The sun getting low, casting an evening glow on that half-bottle of Beaujolais and your penultimate salmon preparation. Now head to your local fishmonger, grocery store, get a fishing pole, whatever, and corral some salmon. And pour yourself some Beaujolais.